The Pedego Ridge Rider is the ultimate electric mountain bike - giving you the freedom to venture off the beaten path and enjoy the great outdoors! Who says that electric bikes have to stay on the pavement? (Many laws, actually.) Nevertheless, when you're craving adventure, don't let your bike hold you back. The Ridge Rider is an electric mountain bike designed to give you the ability to pursue. 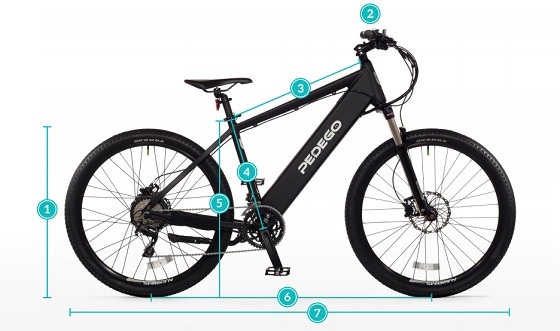 The Pedego Ridge Rider is a high performing mountain electric bicycle. The 500W, geared motor delivers best-in-class acceleration and hill climbing. The sensation of power it gives you is exhilarating. The 48V battery is lightweight and long lasting. It uses Samsung cells with cutting edge lithium-ion technology and an industry three-year warranty. The Shimano SLX 20 speed drivetrain, special to the Ridge Rider, allows for easy pedaling and smooth shifting. The Maguro hydraulic brakes with 180mm rotors allow you to stop on a dime, and the Suntour XCR suspension fork with 120mm of travel helps you maintain traction and ride comfortably over rough terrain. The Ridge Rider offers five layers of pedal assist and one layer of throttle-only riding. Experience reliable and user-friendly riding with the 27.5" wheels, the lockout switch on the fork, and the through hub with a quick lever release to fit into your vehicle. The Pedego Ridge Rider is equipped with the 48V 11Ah battery, which is a slightly more powerful version of the 48V 10Ah. You'll be able to see a little more distance per charge, and it's a great option for riders over 200-pounds, or those who plan on riding in strong headwinds or hills. 31 in. 28 in. 23 in. 18.75 in. 30 in. 46.5 in. 73 in.